The Whitewater Valley Wine Society is a wine appreciation society, based in the village of Hook in North Hampshire. Our aim is to be friendly, welcoming and to provide a good mixture of fun, learning and social events. If you enjoy wine, then we’re confident you’ll be interested in our tastings and special events. The Society has been meeting in Hook for 30 years, during which time we have tasted wines from almost every part of the world. Most of our evening tastings are led by a guest speaker. Each year we introduce some new speakers, whilst retaining our favourite speakers who return to present different topics on a regular basis. The Society now has about 70 members, more than at any time in its history. About half of our members live in Hook, with most of the remainder living across North Hampshire. Such is the popularity of our tastings that attendance usually averages 40-45 members and guests. From time to time, we also organise a number of special events, including fine wine dinners, visits to local restaurants, barbecues and summer garden parties. 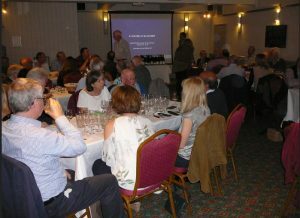 The photo shows members enjoying the tasting at a typical evening at The Raven Hotel. Those attending are seated on tables of 7 or 8, so if you are a newcomer, it’s a great way to meet other members!